Results of a 2-year low-level laser study by Dr. Markou and our clinics, have been published in the International Journal of Cosmetic Surgery and Aesthetic Dermatology. The authors wished to confirm the efficacy of low level laser therapy (LLLT) using a HairMax LaserComb for the stimulation of hair growth and also to determine what effect LLLT with this device had on the tensile strength of hair. 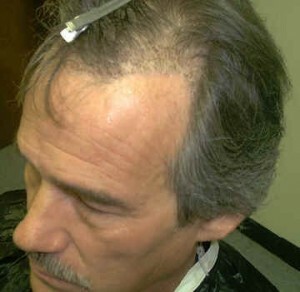 Thirty-five patients, 28 males and 7 females, with androgenetic alopecia (AGA) underwent treatment for a six-month period. Both the hair counts and tensile strength of the hair were affected very beneficially in both sexes in the temporal and vertex regions, with the males and vertex areas showing the most improvement. percent female. Hair samples taken for microscopic examination, tested for strength, on the VIP Hair O Scope. Hair loss and duration are recorded on the Hamilton Scale. Hair counts in one Cm and photo is taken. Results are confirmed by Histological examination. 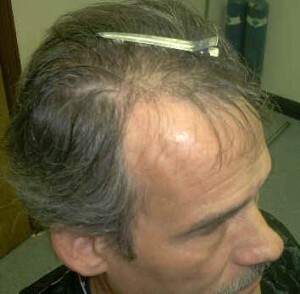 (Ten) Hair transplant patients were treated, once per day, on one half of transplanted scalp with (Laser Comb). Photos were taken at twenty four hours Post Op and one week Post Op. The half not treated with the Laser Comb was cared for in the normal manner of shampooing and mild treatment in the transplant areas. Photos were taken at twenty four hour post op and one week post op. 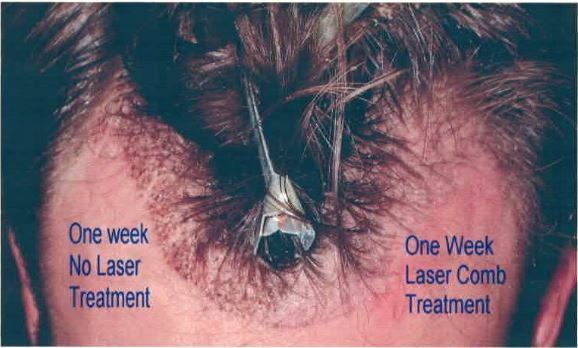 The Laser Comb treated side, displayed little redness or skin discolor at 48hrs. (comparatively to non treated side). In one week, laser treated side showed little evidence of surgery, while non treated side showed normal healing process. This study is on going to compare rate of hair transplant growth and healing. The use of Low Level Lasers (Post Op) may result in: faster healing, less trauma and better patient acceptance of the procedure. We currently recommend post operative, hair transplant patients to use Low Level Laser Treatments in the harvested and recipient areas for at least two weeks. Our published study was submitted to the for FDA for medical approval of the LaserComb.